Heavy Grape Pattern on left in Rose Ice (pink crizzled on clear glass- marigold) Stretch Glass. It is mainly accepted by collectors that Carnival Glass is iridized pressed pattern glass and that Stretch glass is usually non patterned pressed iridized, ‘refired’ glass having a wrinkled-“stretched” surface effect. But Imperial madepatterned “Stretch Glass” as well as non-patterned pieces! Imperial called one of their lines of stretch glass “Satin Iridescent Colors”: “All in crizzled satin effects”. It came in the following listed colors: “Iris Ice, white crizzled on crystal glass [white stretch]; Rose Ice, pink crizzled on crystal glass [marigold stretch]; Blue Ice, crizzled on crystal glass [smoke stretch];Amber Ice, crizzled on amber glass[amber stretch]; Green Ice, crizzled on green glass [green stretch]; and Amethyst Ice, crizzled on mulberry glass” [amethyst stretch]. The color names for the Heavy Grape pieces both stretch and carnival glass are from original Imperial catalogs. Imperial used numbers and colors to denote its glass. In the Satin iridescent line (Stretch): the eleven inch Heavy Grape cake plate #7007/4D was sold in Rose Ice, Blue Ice and Iris Ice. 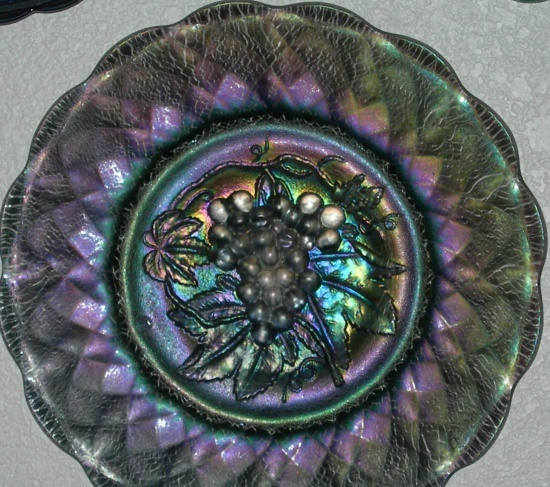 This particular group of three was sold as a lot #2079 consisting of 4½ dozen assorted plates in one barrel, 6 each of 3 plates in bright iridescent colors each in 3 satin iridescent colors. 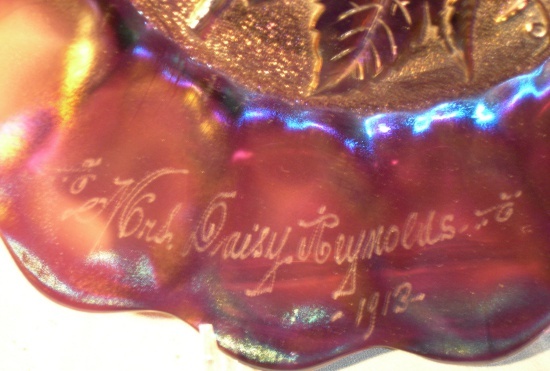 The plates in “Bright Iridescent Colors” (Carnival) were given the same number designation but listed in Azur (dark Amethyst), Rubygold (Marigold), Helios (Green), and Peacock (Rainbow of colors) colors. 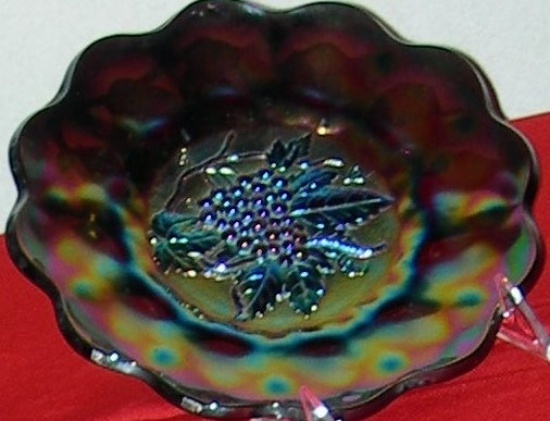 There is also a 7 ½” salad plate in the Heavy Grape Pattern in Azur (dark amethyst) and also in Rubygold (marigold). But none have been found in the Satin Iridescent Colors (stretch glass). Has anyone ever seen any? 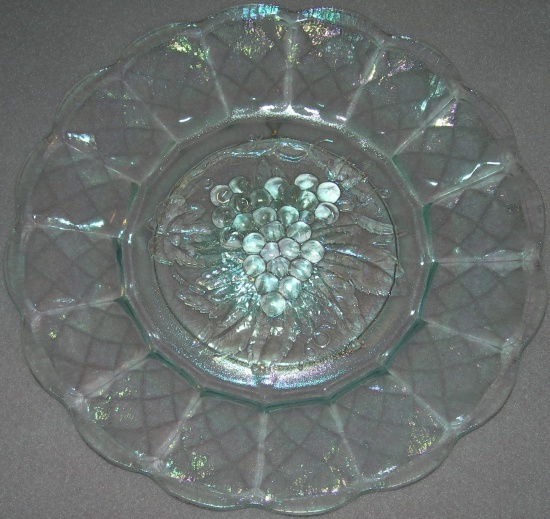 The Iris Ice Heavy Grape Plate comes both in a plain plate with a stretch finish and 5 are known to have a hole drilled in the top paneling of the plate. They must have been drilled soon after the plates were made as the holes look professional. We surmise that the holes were drilled so that salesmen could hang the plate on the wall. The plates with the drilled holes were found in the early 1970’s in the Los Angeles area by Bill Carol. In the early 1970’s, the Fenton Art Glass Company had a line of “Heavy Grape” pieces mainly consisted of nappies and small pieces no plates. We showed Frank Fenton a page of the old Imperial catalog with the Heavy Grape plate. Fenton’s line of Heavy Grape was immediately discontinued. All of the Fenton pieces were marked with an embossed Fenton in an oval on the base of the pieces.